It is not easy to work on an onshore or offshore oil and gas platform. Especially because of the higher risks of occupational hazards caused by fires, dangerous chemicals and high levels of noise. The general range of human hearing is between 20 Hz to 20,000 Hz. In terms of loudness, people can hear from 0 decibels (dB) onwards. Sounds that are more than 85 dB(A) can be dangerous for your hearing in the case of prolonged exposure. NORSOK states that the maximum exposure of an employee to noise during a 12 hour work day is 83 dB(A). The maximum allowable noise level in any situation is 130 dB(A) (peak). This limit also applies to enclosed "normally unmanned areas". The main problems on an onshore or offshore structures are presented by airborne sound. This type of sound is generated by people, electrical machines and heavy equipment and cause the noise source in one room to induce sound vibrations in other rooms. In order to prevent this from happening, partitions between rooms, by means of walls, doors and windows, should be sufficiently insulated. The right level of insulation can be achieved by layers of e.g. mineral wool. Each area on a platform is different. Naturally, there are higher levels of noise in production areas where heavy equipment are present than in the living quarters. According to the NORSOK standard, the maximum noise exposure in workshops and the galley should be 83 dB. In these areas, it is required to use low-noise equipment. During emergency conditions, other requirements apply. Nearby areas such as safety relief valves, fire pumps or outdoor areas during full emergency flaring, the maximum allowable noise level is 130 dB(A). The maximum noise level in the muster area is required to be 90 dB(A). And in the radio room, the emergency management room and the central control room this level has to be 60 dB(A). 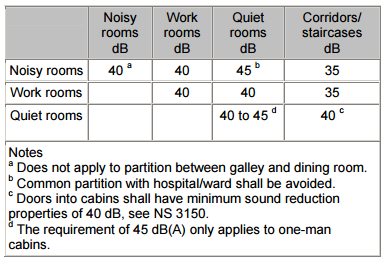 The table below outlines the minimum permissible field-measured weighted sound reduction index between rooms in the living quarters. “Noisy rooms” can be the gymnasium, television rooms/cinema, the printer room, the galley, the dining room, and the changing room. "Work rooms" are offices, meeting rooms, the radio room, and control rooms. "Quiet rooms" require a high degree of privacy and include cabins, hospital/ward, and rest rooms, e.g. reading rooms. 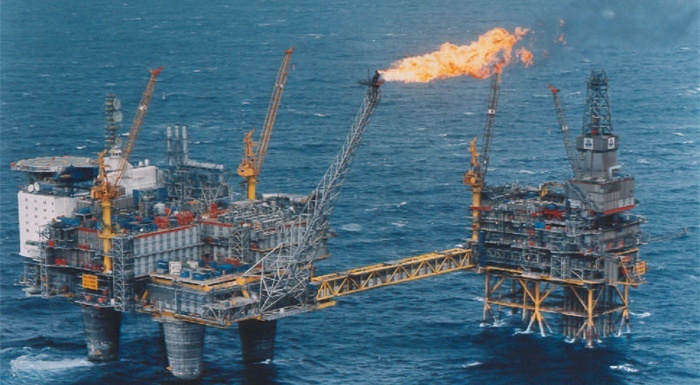 Health and safety planning in the oil and gas industry does not only encompass fire and blast protection. Noise protection is also a very important part of the whole equation. Therefore, a lot of attention should be given to acoustic control during the design and construction phase of each project. By doing so, you can provide the highest levels of noise protection to your personnel. Do you want to know more about our acoustics for fire protective solutions? Please download our eBook. 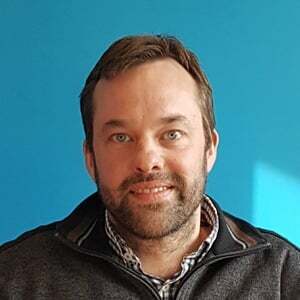 Jasper is a creative R&D manager with a deep understanding of industrial design. With his excellent supervisory and teamwork skills, he delivers the best products for customers with the R&D team. He has an inquiring mind, intense curiosity, and strong desire to innovate in the fire and blast protective products market.